Potty like a rock star. During your child's potty training journey, you will need a sit down potty as well as a separate potty seat for use on the big-person toilet. This hard-working multitasker combines both. Plus, it integrates the power of Arm & Hammer™ baking soda for safe and effective odor control. Designed for use at multiple stages of toilet training, our award-winning Multi-Stage™ 3-in-1 Potty Seat is a triple threat, helping your child pass through each phase with flying colors. For beginners, it acts as a sit-down potty chair with built-in splash guards to prevent splatter and easy-to-grasp side grips for stability. For more advanced learners, the removable top can be placed atop a regular toilet seat. No matter what age or stage, the seat converts to a convenient toddler step stool as well. 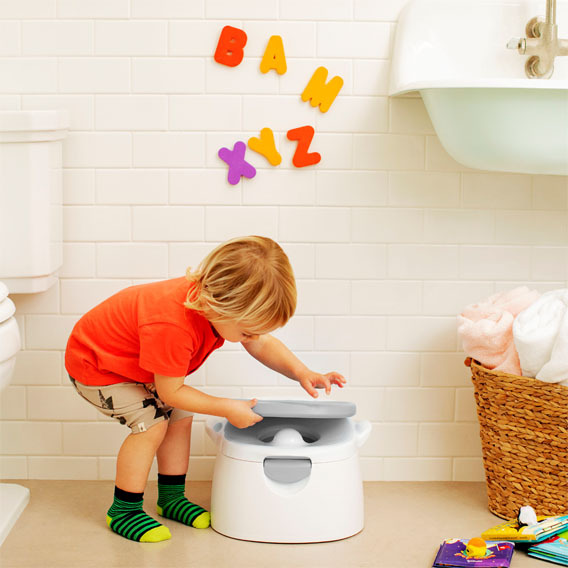 Potty training as easy as 1-2-3.